TOMRA Sorting Solutions has installed a brand new 56 square meter cold room in its test and demonstration center in Leuven, Belgium. 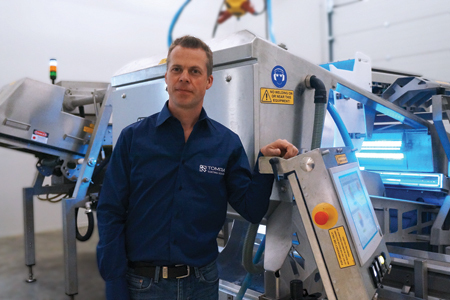 Thanks to its new facility, TOMRA Sorting Solutions is now able to test the performance of its sorting machines for all individually quick frozen (IQF) products in a true-to life environment. The conditioned room can accommodate two sorting machines at the same time, enabling parallel testing and comparisons. It features an indirect cooling system, fully controlled automatic access doors and LED lighting. "It's a fact that sorting performance and results are affected greatly by the external environment. Defrosting, sticking of the product and changing defect conditions are known issues when testing IQF products. Normal operating temperature in IQF production facilities is around five degrees, but we can set our cold room as low as minus two degrees," says Wim Van Doren, Sales Application Manager at TOMRA Sorting Solutions. He adds: "Our investment in this cold room allows our customers to see the sorting line in realistic circumstances and they can see first-hand the capabilities of our machines operating in these severe conditions." Should TOMRA need to test its machines in a hot climate, special heaters can warm the room from its standard minus two degrees to sixty degrees. The room is attached to the company's existing test and demonstration hall by glass windows. The entrance is provided along the current demo center and the back of the room has a large roll up gate that enables large sorting machines to be moved in and out easily. TOMRA's new cold room will be managed by Wim Van Doren's demo team, but it will also be used by other departments, such as research and development (R&D). "The cold room can be implemented as well for long-term validations/trials of sorting machines for R&D purposes, to serve our customers even better," adds Van Doren. In June 2014 TOMRA Sorting Solutions installed the first cold room in its state-of-the-art facility in Sacramento, United States of America. TOMRA Sorting Solutions runs fifteen test and demonstration centers worldwide providing services for the development of sensor-based sorting projects for the food, mining, recycling, tobacco and virgin plastics industry to provide their customers with the best possible service. Six of their fifteen sorting solution centers are solely focused on food with each providing different food testing possibilities. For the North American market TOMRA can invite customers to one of their two test and demonstrations centers in the USA, located in Denver, Colorado, and Sacramento, California. In Asia TOMRA also has two test and demonstration centres available, located in Saitama, Japan and Xiamen, China. TOMRA Sorting Food, formerly BEST and ODENBERG, designs and manufactures sensor-based sorting machines for the food industry. Over 7,500 systems are installed at food growers, packers and processers worldwide. The company provides high-performance optical sorters, graders, peeling and process analytics systems for nuts and seeds, dried fruits, potato products, fruits, vegetables, meat and seafood. The systems ensure an optimal quality and yield, resulting in increased productivity, throughput and an effective use of resources. TOMRA Sorting Food is part of TOMRA Sorting Solutions which also develops sensor-based systems for the recycling, mining and other industries. This powerful combination of technologies makes TOMRA Sorting one of the most advanced providers of sensor-based sorting solutions in the world, with over 11,500 of its systems installed globally. TOMRA Sorting is owned by Norwegian company TOMRA Systems ASA, which is listed on the Oslo Stock Exchange. Founded in 1972, TOMRA Systems ASA has a turnover around €530M and employs over 2,500 people. For more information, visit www.tomra.com/food.